Our free AI-powered resume checker scores your resume on key criteria recruiters and hiring managers look for. Get actionable steps to revamp your resume and land more interviews. Our resume checker scans your resume for inconsistencies, length, impact, brevity and style. It's powered by Artificial Intelligence. 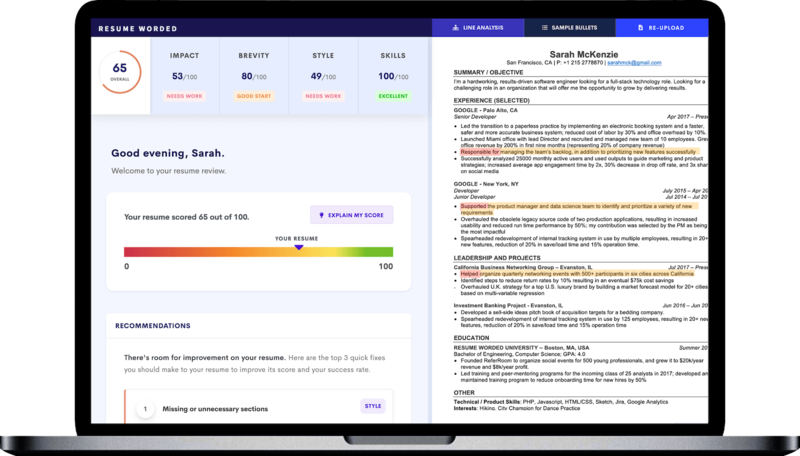 Score My Resume goes beyond basic spell checking and uses leading Artificial Intelligence technology to grade your resume on 20+ resume checks that recruiters and hiring managers pay attention to. Specifically, the platform analyzes your resume's impact by evaluating the strength of your word choice, and also checks your resume's style and brevity. Similarly, it also scores each of the bullet points on your resume and checks for key elements such as inconsistencies, length, word choice, filler words, keywords and buzzwords. Our online resume grader provides better resume feedback than most so-called 'professional' reviewers out there, who often give outdated, wrong or non-actionable advice and charge hundreds of dollars. The feedback in your resume review has been curated by current hiring managers and recruiters at companies like Google, McKinsey and Goldman Sachs. We recognise how tough it can be to put your experiences into concise, effective lines. This is why we even give you handpicked resume lines and metrics that top candidates have used on their resumes. You can use these as inspiration when writing your resume. We use Artificial Intelligence to analyze and benchmark your resume and generate a detailed assessment and score based on key evaluation criteria such as Impact, Brevity and Style. Our criteria are based on key checks recruiters look for. Incorporate the feedback we give you to improve your resume's score and your chances of getting that interview. Improve your resume score and grade using our actionable tips. Get a comprehensive free resume review. - ATS resume compatibility: Score My Resume analyzes your resume's template and checks whether it is compatible with ATS (resume scanners). - Resume and bullet point length: Brevity is key when it comes to a resume. - Resume action verbs: Recruiters and resume reviewers are looking for evidence of impact on your resume. Score My Resume checks to make sure that you've used strong action verbs as well as other indicators of a strong impact-oriented resume. - Plus over 25 additional free resume checks. See our resume checklist for examples of additional checks recruiters look for. Most advice online is terribly generic and unhelpful, saying, “Be impactful!” or “Don’t be vague” (how ironic). These are statements that only become helpful when they are explained in context of your resume. Unlike any other tool, our resume checker identifies gaps on your resume and gives you a detailed assessment of your resume, which contains tailored advice on how to improve it, backed up with insight from recruiters and examples from other candidates. Specific and personalized feedback on how to improve your resume. Improve your resume score and your chances of getting the interview. How does our resume checker work? To create this product, we spent thousands of hours speaking with recruiters and hiring managers at top companies like Google and McKinsey. We've found out exactly what they look for when they review resumes. We then spent the next two years working with data scientists and software engineers to create this resume checker. It uses machine learning and artificial intelligence to scan your resume for the most important elements resume reviewers and hiring managers specifically keep an eye out for. Get actionable insights on how to improve your LinkedIn profile by using our LinkedIn profile checker. Get unlimited resume reviews to the Score My Resume resume checking platform, ATS-optimized resume templates, and more.